For 159 years, the University of Michigan Men’s Glee Club has been at the pinnacle of male choral ensemble singing. It has traversed every corner of the United States and the world, been awarded first place at premier international choral festivals, and has performed for major world leaders including the President of the United States, the Queen of the Netherlands, and others. The following is a brief account of our history. From the very humblest of beginnings, the Men’s Glee Club was founded in 1859, just one year after the inception of the oldest collegiate chorus in the country, the Harvard Glee Club. This makes UMMGC the second-oldest collegiate chorus in the country, and it is the oldest student organization on the University of Michigan campus. It began with just a fraction of the Glee Club’s current size, with just 10-20 members. These members were arranged by graduating class, and so in its earliest years, there were three separate Glee Clubs. Interestingly, a freshman Glee Club was not organized until a later decade. Not much else is known about this time, however this first decade provided the foundation for the Glee Club and sparked the flame that would continue to grow for years to come. 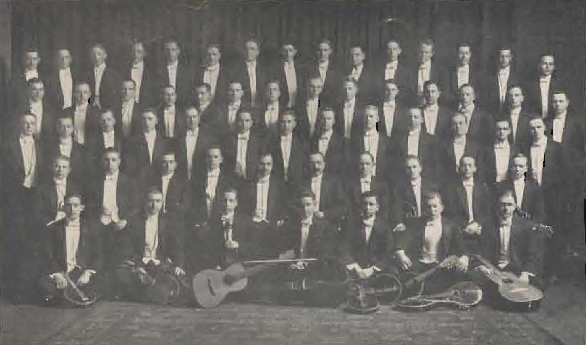 1890 saw the merger of the Glee Club and the Michigan Banjo Club, and the resulting Glee and Banjo Club was joined again by the Mandolin Club in 1897, yielding the University Glee, Banjo, and Mandolin Club. 1890 also saw the creation of the freshman Glee Club, which was active for just a few years before disbanding (guess the Old Guys were too classy?). With joyful hearts, the University Banjo Club strummed away with the singers and mandolinists until 1905, when the group disbanded (RIP), leaving the University of Michigan Glee and Mandolin Club. Just a few years down the road, 1908 saw the introduction of a university faculty director for the first time in its nearly 50-year history. The “music director” position continued as an advisory role until the 1920s, however this was a major change in Glee Club culture, as there was a truly “adult presence” in the organization. In 1932, Prof. David E. Mattern began his tenure as music director of the Glee Club. He held the position until 1947, which is the second-longest tenure of any Glee Club director, second only to Philip Duey. In 1940 and 1941, the Glee Club embarked on its first tours since 1926, to the Eastern States and Prairie States respectively. Yet once again, tours were halted starting in 1942 due to World War II, and they only picked up again after Mattern ended his tenure as director. Even though the tour manager position was rather inactive in this era, the Glee Club had its fair share of activity. 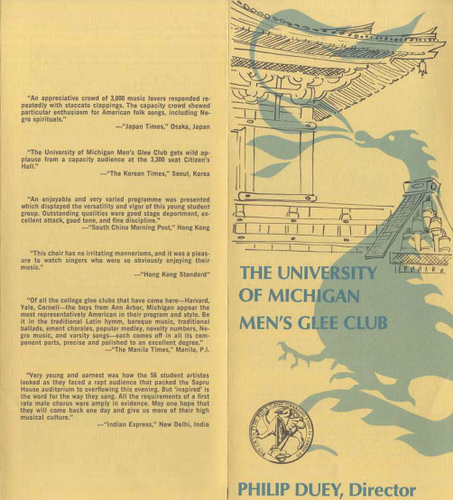 Due to the rising popularity of the Women’s Glee Club, the Glee Club officially changed its name to the University of Michigan Men’s Glee Club to distinguish between the two groups. For a brief time shortly thereafter, the Men’s Glee Club was renamed to the Michigan Varsity Men’s Glee Club, but was renamed back to the University of Michigan Men’s Glee Club in 1938, and has remained that way to this day. With a brand firmly established and tours back in the Club’s tradition, the Glee Club continued to be Michigan’s choir. However, few could have predicted where the Glee Club was going next. It is difficult to imagine where Glee Club would be without the enormous influence of Professor Philip A. Duey. Over his 22 years of service to the Men’s Glee Club, Dr. Duey brought sweeping changes to the Glee Club and gave the group a new position and reputation in the world of choral music. As soon as he arrived in 1947, the Glee Club began recording songs that were broadcast periodically on local radio. In 1951, the Men’s Glee Club began the tradition of hosting combined concerts with the Glee Clubs of football opponents, the first of these opponents being the Cornell Glee Club. From there, two East Coast tours, a 1952 appearance on Ed Sullivan’s “Toast of the Town,” and the recording of the music for Songs of the Colleges, a motion picture that features images from colleges across the United States, gave the Glee Club national acclaim. But Dr. Duey did not stop there. Spring of 1955 marked the inaugural year of international tours, when the Glee Club traveled on a four-week voyage to Europe. Performances included a concert for Queen Juliana of the Netherlands and a trip to the American Embassy in Rome. Following the massive success of this tour, the Men’s Glee Club had reached the pinnacle of all the groups that came before them, surpassing all financial and musical expectations. Glee Club operations changed slightly as well during the first part of Dr. Duey’s tenure. Three small groups came and went, with Midnight Sons departing and the Novelaires and the Key Changers being formed. For a few short years, these two groups continued the repertoire of the Midnight Sons and the Varsity Quartette before both disbanded in the years to come. Soon after, Dr. Walter Collins took the position of interim music director of the Glee Club for one year. An important year in the Glee Club’s history, 1956 saw the creation of The Friars, an eight-member ensemble modeled after the Yale Whiffenpoofs. 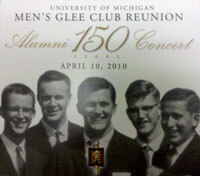 The Friars are the oldest extracurricular group at the University of Michigan, and the group begins the second half of Glee Club concert to this day. Dr. Philip Duey resumed his tenure as music director of the Men’s Glee Club in 1957. Two years later, the Glee Club celebrated its centennial year, and in honor of this historic milestone, Earl V. Moore and J. Fred Lawton composed The Hymn, one of the most reverent pieces in the Glee Club song collection. In addition, the Glee Club embarked on another four-week European tour, and it was over this tour that the Glee Club’s most prestigious achievement took place. The International Eisteddfod is an annual music and poetry competition that takes place in Llangollen, Wales. One of the most influential music competitions in the world, the Men’s Glee Club saw no better way to participate for its centennial year. After a grueling boat voyage and little sleep, the Glee Club became the first American choir in history to take first prize in the festival’s male chorus competition. This feat sent the Glee Club into history and solidified its reputation as an international powerhouse. And as if once wasn’t enough for Dr. Duey, during the following international tour, a repeat trip to Europe in 1963, the Glee Club was awarded first prize in the Eisteddfod Festival for the second time. Concert program from Llanlgollen, 1963. Shortly thereafter in 1965, the Glee Club was invited to represent the United States at the first ever International University Choral Festival, along with three other United States university choruses, in New York City and Washington D.C. Two years later, the year 1967 rolled around—the sesquicentennial year of the University of Michigan. To celebrate this landmark, the Men’s Glee Club launched an eight-week world tour, the largest ever in the Club’s history. 17 different nations were featured on the tour, including the Soviet Union. A controversial move at the time, though due in large part to the Club’s massive global reputation. The tour concluded with a third trip to the Llangollen Eisteddfod, and despite the general exhaustion of everyone involved in the tour, the Glee Club competed and achieved a third-place finish. Throughout the 1960s, Dr. Duey continued to grow Club’s reputation, and after over 20 years of service, he retired in 1969. His legacy on the group was felt by all at the time and continues to live on in the conversations shared with alumni from the Duey Era. A Llangollen medal awarded to the Men's Glee Club from winning the Eisteddfod Festival in 1978. The 1970s saw two Glee Club music directors: Dr. Willis C. Patterson and Dr. Leonard A. Johnson. Overall, this decade did not see too much groundbreaking activity considering the massive accomplishments of the years before. Tours were kept mostly in the United States, and Glee Club life proceeded at its usual steady pace, evolving with the rapidly changing world and nation around it. Despite this, two impressive accomplishments were once again achieved under both directors. Both directors took the Glee Club back to Europe, and both times the Glee Club was awarded first prize yet again at the Llangollen Eisteddfod Festival. The 1978 Europe Tour was the final tour in which the Glee Club competed for first place in Llangollen, due in large part to changes in the University calendar. However, in the spirit of the competition and to honor the Club’s largest international accomplishments, the Glee Club presents four Llangollen awards to members at the end of the academic year. One another notable change in Glee Club tradition, this one directed at the Camaraderie pillar, was the closing of the local Pretzel Bell Bar. A favorite of the Glee Club for decades, this raucous locale was the site of post-Thursday rehearsal gatherings for the Club to eat, drink, sing, and just have a grand night out with each other. After the closing of the Pretzel Bell, the Club moved to Cottage Inn and briefly to Metzger’s, where members would often sing to earn pizza and beer. Thus, the new tradition of Cottage Inn pizza was established, a tradition that lives on to this day. The Men's Glee Club performing the National Anthem at the 1984 World Series. 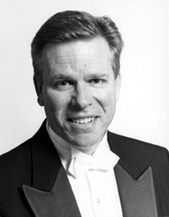 Following Dr. Johnson’s retirement from the group in 1981, Dr. Patrick G. Gardner took the helm as music director. One big change to Glee Club life was the switch to Uno’s Pizza for post-Thursday rehearsal gatherings at some point in the early 1980s (precise year unknown), and it was here that the tradition remained for the next 15 years. The Gardner tenure saw a few notable highlights in the Glee Club’s history. Entering the world of sports for the first time ever, the Glee Club traveled to Detroit, MI the performance of the national anthem on one of the most prestigious stages in the sports world—Game 7 of the 1984 World Series. While the performance was successful, riots and violence following the game forced the singers to take shelter in a safe location. The following year, Dr. Gardner led the Glee Club on yet another European tour, which ended with the Glee Club’s final appearance at the Llangollen Eisteddfod, and Club left Europe with an impressive 3rd place finish. The Gardner tenure also saw the move to Uno’s pizzeria, which remained the go-to location for post-rehearsal festivities for nearly 20 years. Following Dr. Gardner’s retirement from the Glee Club, Dr. Bradley Bloom directed Glee Club for one year as interim director. He led a tour to the Eastern United States as the group prepared to usher in the next full-time director. In a sweeping 13-year career, Dr. Jerry Blackstone introduced a new resolve for the Glee Club. It seemed that almost every year was filled with something historic. In his inaugural year, Dr. Blackstone led the group on a three-week tour of East Asia, as well as saw the creation of a new constitution. 1990 kicked off the annual tradition of Phone-a-Thon, a fundraising opportunity that allows clubbers to not only raise money for Glee Club, but also to communicate with and learn the stories of alumni. 1991 saw the first ever Male Vocal Arts Day, in which high school singers from around Michigan join the Men’s Glee Club in a day of music-learning and camaraderie. In 1992, Dr. Blackstone led his second international tour to Eastern Europe, a historic move given the recent collapse of the Soviet Union, and Glee Club was one of the first American groups to visit Estonia. In the following year, David Wynne, a member of the Glee Club for one year, passed away. In his will, he left $15,000 for the Men’s Glee Club for free pizza and drinks at Uno’s once per semester. The tradition carried on with the subsequent move to Cottage Inn, and to this day remains one of the Glee Club’s most venerated traditions. 1996 was the year of the next international tour, this time traveling across South America for the first time in Glee Club’s history, and in 2000, the Glee Club flew to Australia for the first time ever. 2000 also saw the Club’s permanent move to Cottage Inn pizza, the current location for the Glee Club’s post-rehearsal festivities (with a brief interruption in 2016). Domestically, the Glee Club was honored with more impressive milestones, with an invitation to the 1997 American Choral Directors Association national convention in San Diego, as well as six compact disc releases. To culminate his impressive career directing the Glee Club, Dr. Blackstone led the Michigan and Smith College Glee Clubs in a combined performance of Brahms’ Ein deutsches Requiem in Northampton, Massachusetts. The performance was repeated with the Women’s Glee Clubs of both institutions in Ann Arbor the following fall. Dr. Blackstone stepped down as Glee Club director in 2002 following his promotion to director of choirs at U of M, but his proactive tenure brought the Glee Club into American homes and spurred a new direction for the Glee Club forever. Following Dr. Blackstone’s retirement, Stephen Lusmann took over as Glee Club director. A world-renowned baritone, Lusmann involved the Glee Club in many domestic collaborations. Classical performances included a performance of Beethoven’s Ninth Symphony at Carnegie Hall and Shostakovich’s 13th Symphony in collaboration with the Kirov Orchestra. Entering the sports world once again, Glee Club was featured on ABC performing “Varsity and the Victors” at Cottage Inn before the 2005 Michigan vs Penn State game, and a small group of clubbers performed at the NFL commissioner’s Super Bowl XL tail gate. For his international tour, Lusmann and the Glee Club embarked on a 16-day tour of Great Britain and Ireland. After a short three-year tenure, Stephen Lusmann passed the baton to Dr. Paul Rardin, who worked to solidify Glee Club’s prestige on the U of M campus. Arguably the most prestigious event in the history of the Glee Club at the time, the 150th anniversary of the Glee Club in 2009 brought over 800 Glee Club alumni back to Ann Arbor. With separate alumni choruses sorted by graduating year, the Spring Hill concert in 2010 brought together alumni from all walks of life, in true Glee Club spirit. And to top it all off, all Glee Clubbers, alumni and incumbent, came together for a breathtaking performance of Franz Biebl’s Ave Maria. The sesquicentennial is regarded by many alumni as the quintessential concert in Glee Club history. To conclude his six years as Glee Club director, Paul Rardin took the Glee Club to Cuba in 2011, a controversial and historic move given the history of the relationship with between Cuba and the United States. With Rardin’s tenure over, Glee Club had been established as a campus, national, and international celebrity. At the time, it seemed impossible for Glee Club to go any higher. But as history has shown, that assumption has always been challenged by the next director. Dr. Eugene Rogers was appointed as director of the Men’s Glee Club in Fall 2011. In true Dr. Blackstone fashion, Dr. Rogers spent every one of his seven years making history for the Glee Club. Social justice and outreach programs have been critical agenda items in the Rogers tenure. One example is the annual Brothers in Song program, which aims to promote choral music education and leadership in primarily underprivileged schools around the country. Spring of 2012 saw a five-city concert tour of China. In the following year, Dr. Rogers and the Glee Club traveled to New England for a historic collaboration with the Harvard and Yale Glee Clubs, the country’s three oldest Glee Clubs, as well as a performance at Lincoln Center in New York City. 2014 was a major year for the Glee Club. After being honored to perform at the inauguration of incumbent University of Michigan president Mark Schlissel, the Glee Club traveled to the ACDA national convention in Salt Lake City, a tour that was completely free of charge for every member of Club, a testament to the Club’s impressive financial accomplishments. Continuing with the core social justice philosophy, in 2015, the Glee Club collaborated with composer Joel Thompson for a performance of Seven Last Words of the Unarmed, a piece written in honor of those who lost their lives to police violence. Spring tour of 2016 completed the Club’s checklist of the World’s continents, with a landmark trip to South Africa. Another massive anniversary year for the University of Michigan and the Glee Club was 2017. In March of that year, members of the Glee Club traveled to Washington D.C. for a performance at the Sphinx Medal of Excellence Awards at the Supreme Court of the United States. In the fall, the University of Michigan celebrated its bicentennial year. The most ambitious event in Glee Club’s history since the World Tour, the Glee Club invited male college choruses from across the Midwest, high schoolers from the state of Michigan, and renowned choral clinicians from around the globe to the Ambassadors of Song symposium. Dr. Rogers will enter his final year directing the Glee Club in 2018 following his promotion to Director of Choirs at the University of Michigan. His final year will include an appearance at ACDA Midwest in Chicago and a performance at Chicago Symphony Hall as part of the West Coast Spring Tour.